Go to cave, drink beer, feel good. That’s the unusual treat in store at the Reigate Tunnel Beer Festival where 48 craft ales will be on offer plus 3 ciders and 3 different gins. The Festival started in 2016 as the brainchild of Paul Dyer and the association with Redhill Redstone Rotary Club generated ‘Ale for Aid’. 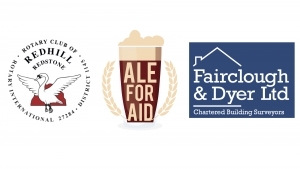 The generous sponsorship of many local businesses means that the money generated by the sale of every entrance ticket and every drop of beer passes to the two main charities plus many other smaller local good causes. This means you can feel genuinely good about yourself – for drinking beer! Last year’s event was a runaway success and raised a huge amount.